Location: Niles Blvd @ D St. Comments: Conifer native to the coastal area and mountains of southern Oregon and northern California. Has small scale-like green needles on sprays similar to Incense cedars, but has small round blue-green cones. Mature height to 60' in native environment, but much shorter in cultivation. 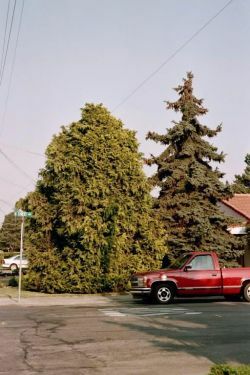 Specimen tree has a distinct yellow-green color of the cultivar "aurea".